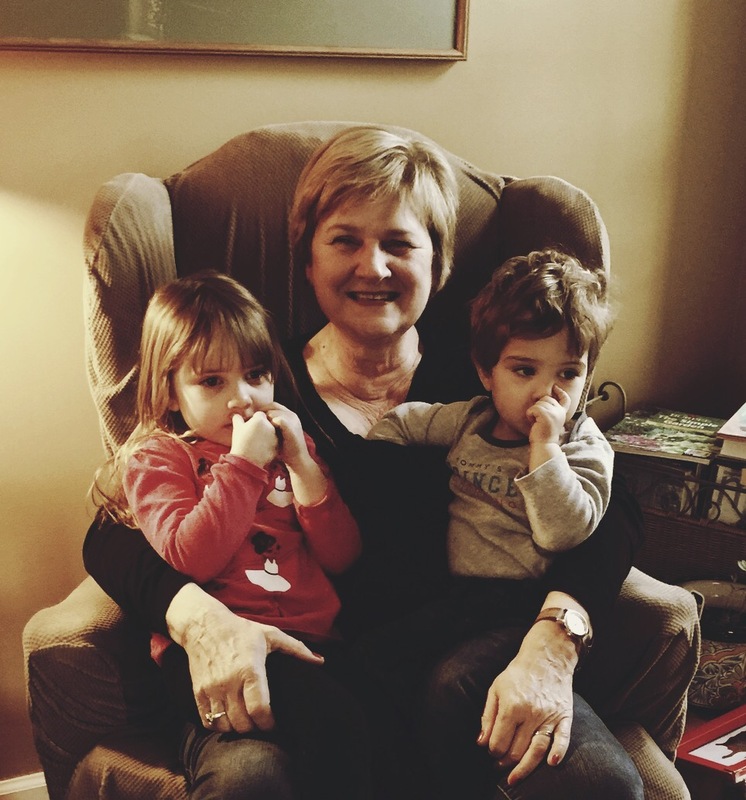 My mother does so much for me, my kids, my sister, her kids, and my dad – it is the personification of love. I will never be able to repay her for all she has done or will do for us all. Often her special days are celebrated with a phone call or quick text, while our children’s days are weekend events. This year even though my work is more demanding than ever and I have one child in school – I decided we would visit her for her birthday. She was born 2 weeks after New Years, so historically a time of year when everyone is done with family events and out of money. This year I hosted out of town family visitors for 2 weeks and had one work week and now Grammies weekend is here. So even though my house is a wreck and my husband and I have no idea what it feels like to be alone…I loaded the kids and am at my moms. Now before anyone starts thinking – wow what an amazing daughter blah blah blah… Truth is I am writing this at a hair salon while my parents watch my kids. This is what I mean when I said my mother is truly selfless. I have been here for two days and feel rested and rejuvenated. My daughter (3 1/2) love parties and she helped me make the cake for Grammies party tonight. My father is making leg of lamb and some vegetables. He grabbed some champagne and we are set for a low key but festive celebration. The cake is modeled after my moms favorite cake as a girl. My mom grew up in Anderson, IN in the 1950-1960s. Her mother was famous for her cooking. She was a casserole making, upside down cake baking wonder. 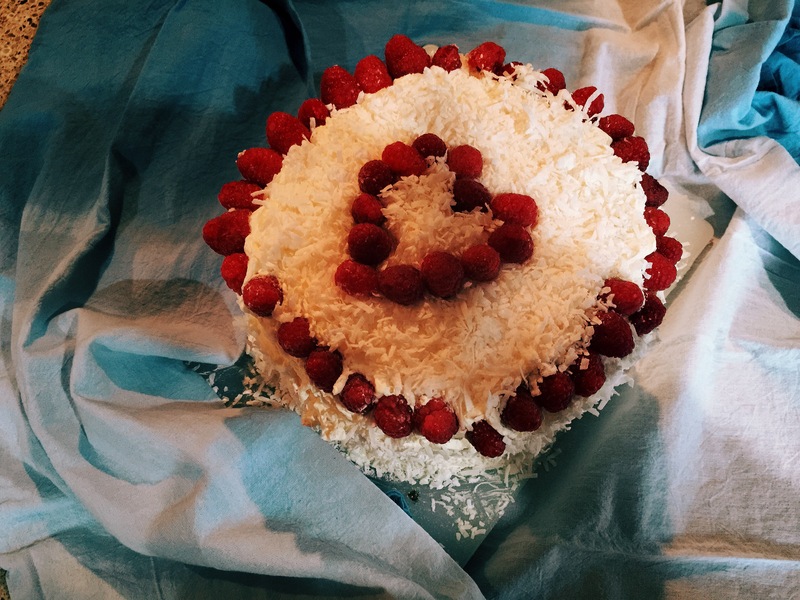 For her only daughter she would make a white cake with raspberry jam filling and frost it with white frosting and cover the entire thing with coconut. I made a lemon cake. The filling between each layer is raspberry coulis. The frosting is a Swiss buttercream (not sure I will ever make that again). 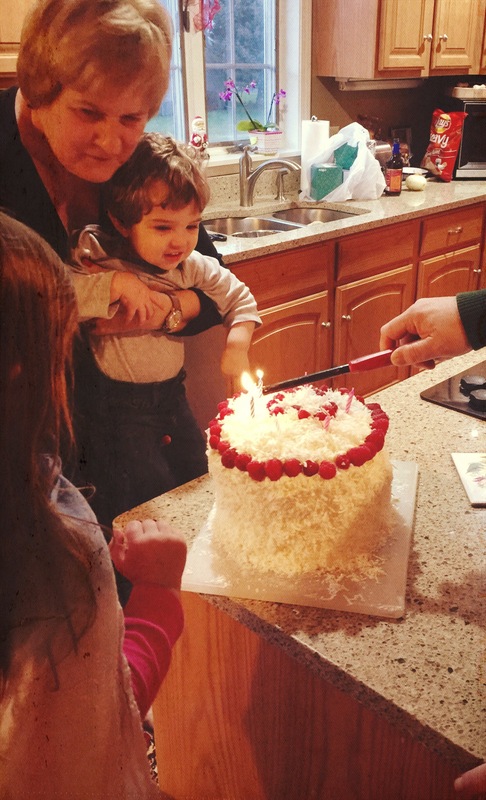 I did place coconut flakes around the entire cake and on the top – my 3 year old placed (very neatly) whole fresh raspberries in a circle around the edge. She asked me to put a heart on to with raspberries so we did. When my mom saw the cake she cried – said it was the fanciest cake she’s ever had. Combine flour, baking powder, salt together in bowl and set aside. Combine eggs and both milks in separate bowl and set aside. In hand mixer bowl combine sugar and lemon zest, mixing well. Slowly add butter to sugar mixture until all butter is added and mix is fluffy. Add 1/3 flour to mixture and mix well. Next add eggs and milk mixing well until you are done with both dry and wet. Add lemon extract at the end. In a double boiler combine 2 1/2 cups of sugar with all egg whites. Whisk continuously until frothy and warm. Remove from heat and place in mixer bowl, wisk until cool to touch. Add butter, slowly allowing butter to blend well. Once all butter is added, add another 1-11/2 cups of 10-X sugar. 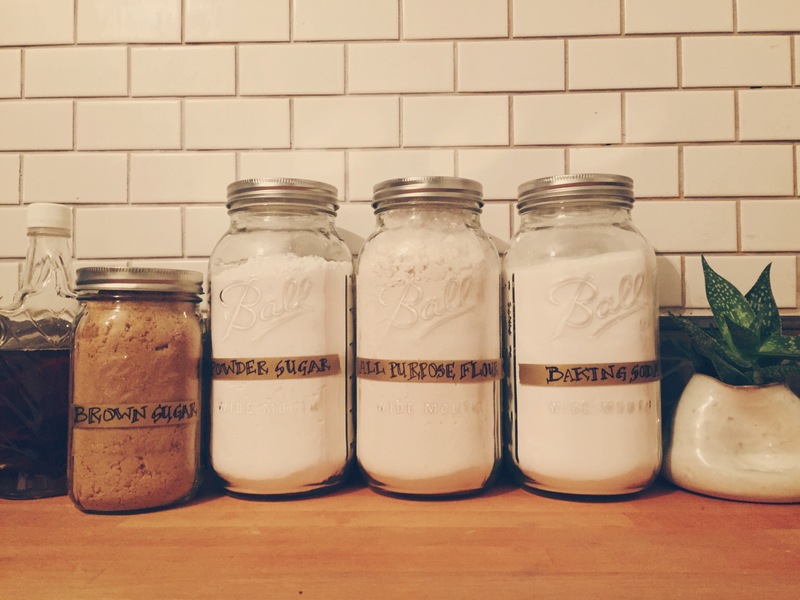 The more sugar you add the stiffer and more sugary the frosting. The less you add the more buttery. Once frosting is at the consistency you prefer, add 1/2 lemon juice mixture and mix well. If too watery add more sugar. Add more lemon juice if wish. Combine all ingredients and reduce mixture by 1/2. Add fresh raspberries at very end and remove from heat immediately after adding. Let mixture cool to room temp before adding to cake. I like to freeze my cakes which gives me more freedoms when I’m decorating, basically it’s more forgiving. I make my cakes 1-3 days ahead and freeze. When I decorate them I take the out of freezer right as I add frosting or filling – I do not thaw. This cake was same. I started decorating by adding a wall around top of bottom layer. This allows the filling to remain in place. Once I made this buttercream wall I added the raspberry filling and then the next cake layer. My cake is 3 layers of 9″ cake. When I added the last layer I dropped the frosting from top and spread a generous amount over entire exterior. When frosting a cake I always believe more frosting is best. So, I add a lot and then slowly take it away as I even out or “tailor” the cake. On this cake you need a lot of frosting for the coconut to stick. Matter of fact, if you don’t have a good 1/4″ layer you won’t get that coconut on the cake. Coconut is a messy business. I don’t know of a clean way to add this to the sides of a cake. My mom love it so I just used my clean hands and patted it on around the entire cake. We had a lot of coconut to clean-up. Next comes the fresh raspberries – my daughter did this part and she had a great time.